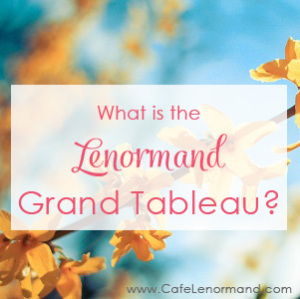 Home » Grand Tableau » What is the Lenormand Grand Tableau? 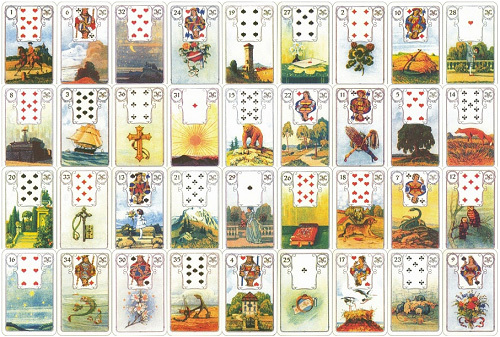 The Lenormand Grand Tableau is the most well-known and used method of reading Lenormand. Grand tableau is French for “the big picture” which describes the type of reading a Grand Tableau provides. It is a divination spread that uses all 36-cards in a Lenormand deck to provide an overview of the querent's life. It looks at many subjects and areas of interest, giving you the ability to get detailed answers about multiple areas of the querent's life and how all the different subjects interconnect. 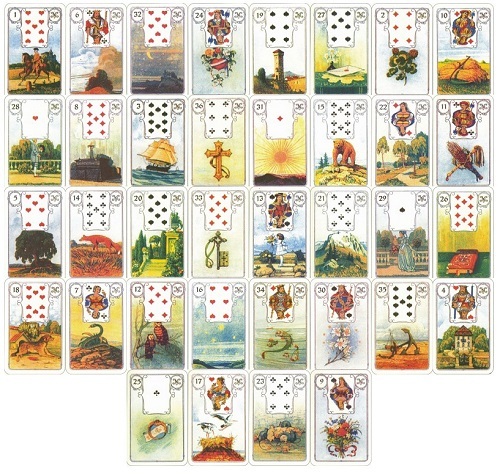 The Lenormand Grand Tableau is a single spread that can answer many questions on many topics. It covers the querent's past, present and future. Reading a Grand Tableau is like putting together a puzzle. There are many pieces and it's up to the reader to put them all together and connect them into a story. So much information is contained in a Lenormand Grand Tableau that it can be quite intimidating for a novice reader. It can take years to fully master the intricacies of reading a Grand Tableau, but once mastered, a skilled reader can provide spot-on analysis of the querent's life, and often identify hidden issues, while providing direction and insight about what is to come. Learning to read a Grand Tableau requires practice and patience. Start with one technique at a time, applying it to only one issue at a time. Allow the cards to connect and speak just as you would with a simple 3-card or 5-card Lenormand spread. Only move on to other techniques and issues when you feel ready. There's no need to rush. There are many ways to approach reading a Grand Tableau, but the best way is the one that works best for you. There are 2 types of Grand Tableau spreads, commonly referred to as the 9×4 and the 8×4+4. One spread is not any better than the other. It's just a matter of reading preference. The same reading techniques are used in both spreads. With the 8×4+4 spread, the final four cards are referred to as the Fate cards. They are read as providing important information or a message about what's to come. The central column of the 9×4 spread can be read in the same manner. I personally use the Lenormand Grand Tableau 9×4 spread because it is the spread I learned with, and thus is the one I am most comfortable reading. I can read an 8×4+4 just as easily; I just have to think a little bit more because I don't use it often. But I have great success with both spreads. These are some of the articles I have written that explain how to read a Lenormand Grand Tableau. * Note: All Grand Tableau deck images are from the Blue Owl Lenormand deck, available at Amazon. Hello! I am absolutely LOVING your site! I could not grasp the concept of Tarot, but Lenormand has come to me quickly and easily. Thank you! My question is, how do you discern what “house” a card is in? Hi Angela, I’m glad you’re enjoying the site! 🙂 Lenormand also came to me much more easily than Tarot. I’m working on an article on houses that will go into more detail. But to know what house a card is in, the method usually used is to sign each card a house that corresponds with the card number. For example, house 1 is the Rider, house 2 is the Clover and so on. The card that falls on number 1 is considered to be in the house of the Rider. The card that falls on number 2 is in the house of the Clover. If the Heart falls on card 1, it’s described as the Heart being in the house of the Rider. So if a card is in the house of the rider how does that affect it? The houses are what confuse me in the GL. It might be easier to think of the houses as another combination, but with a more subtle influence than your regular combinations. If a card falls in its own house, then the card’s meaning has more emphasis. If you know the meanings of the Rider (news, movement), what would it mean to now put the Clover or Ship in the house of the Rider? How will news and movement subtly influence the meaning of those cards? Hello. I am new to this. I am wondering if someone can help me figure out if j am reading my cards right. Someone did my cards. I took a pic. I have been trying to figure out how to read them or if I am reading the correctly.